Teach a Man to Fish | Can we learn to make a living from fishing? Simply. Sustainably. Under sail. Can we learn to make a living from fishing? Simply. Sustainably. Under sail. Teach a Man to Fish is a sustainable fishing project running from the village of Portscatho on the south coast of Cornwall. Our aim is to set up a small business catching fish under sail and oar and selling it locally. 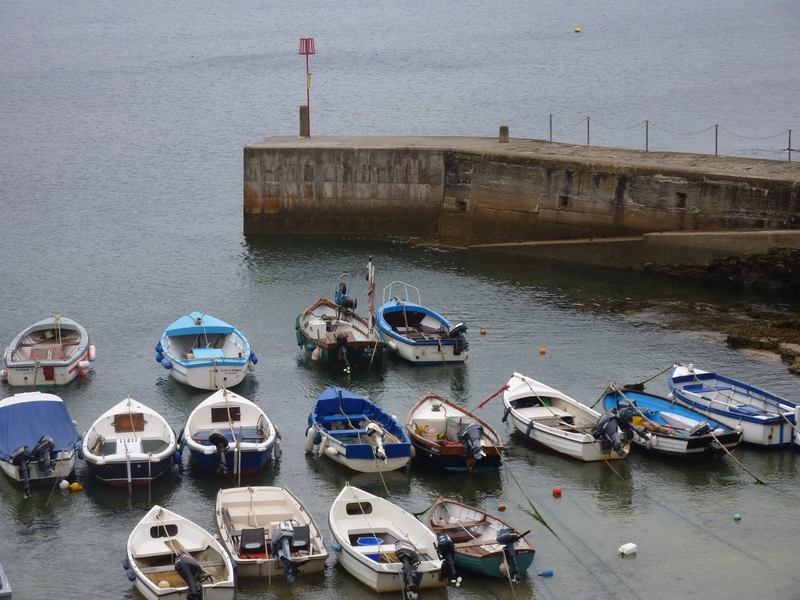 There are harbours all over Britain that were once used for fishing. Good harbours where people built villages around an industry that thrived. The competition from intensive fishing and rocketing fuel prices have changed the industry beyond recognition and now most British ports shelter a fraction of the number of fishing boats they did in the past, or else have become virtually unused. Can you imagine putting in planning permission to build harbours like these today? Or finding the funds to build them with? The winds and the tides haven’t changed. These harbours are still protected from the prevailing winds, set within deep and clear channels, on firm enough ground to dry out a boat, near enough to a path, a road, a slipway and, more often than not, a decent pub. And yet the industry they were built for has all but disappeared. Instead of buying fresh fish from a quay or beach two minutes from where it was caught, the majority of the British public buys air-freighted Pacific-caught tuna from a large supermarket, wrapped in plastic and driven home. But there are signs that commercial fishing is changing; if claims by the European fisheries commissioner are to be believed, 2012 will see an end to discard in the EU’s Common Fisheries Policy reforms. With a growing emphasis on low food mileage and sustainable fishing, more and more people are looking for fresh fish to be available locally from reliable sources. Of course there are some brilliant people out there doing just this already. What we want to achieve is nothing new. Small boat fishermen selling top quality line-caught fish to local businesses and customers do exist and indeed this source of fish has grown hugely in popularity and support in the last few years. And yet the problems of fuel costs and quota allocation faced by Britain’s under ten metre fishing fleet continue. We believe that fishing under sail and oar from a sub ten metre boat has a future. Current EU legislation permits unpowered (i.e. propelled by sail and/or oar only) vessels under 10m in length to fish without a licence, and therefore without a quota. We are lucky enough to live right next to the Fal estuary, home to Europe’s last commercial sailing fishing fleet. The Falmouth Working Boats have been dredging for oysters under sail and oar for centuries, and demonstrate perfectly the viability of fishing in this way. However, despite falling into this category of exemption they have recently been facing a battle over the need for licensing. There seems to be general confusion at government level over the need for licences and registration of unpowered fishing vessels in the under ten category. Over the next few weeks and months we’re going to be designing and building our boat while trying to find out and learn as much as possible about fish and fishing. We want to untangle the legislation surrounding unpowered commercial fishing and research sustainable and responsible fishing methods that will work. Our hope is that we can prove it is possible for an individual to make a living in this way, and encourage others to do the same. We’ll document it all here with posts on the ‘News’ page of our site. Use the links at the bottom of the page to follow us here, on Facebook and on Twitter. Leave us your comments, email us your advice or just keep in touch with our progress. I used to buy fish for the restaurant from Chris Hart when he had his boat in Portscatho. Talk about freshly caught. He used to bring me a wide assortment of fish every day in the summer. Certainly the way to go Cat. You guys are awesome! This is utterly, utterly awesome. Very best of luck … will be following avidly. I am looking forward to seeing how this fantastic project unfolds. Not many people could encapsulate all the concepts you want to draw together. If it can be done, you are the ones to do it! Very excited to read your project on Roseland Online. We will definitely watch your progress and would love to buy your fish as we don’t fish ourselves and it is so difficult to get freshly caught fish despite being so close to the sea. Charlotte will be very excited to hear our your new venture. Bon courage! Thanks so much for your comments Shirley. It’s great to get so much support and feedback from everyone! Classic Sailing based at Parton Vrane on the way to St Anthony are interested in your venture. I have a strong interest in sailing, boat building, and sustainable living so am excited to find your website. I am living in lincolnshire and , as part of our sustainable lifestyle,am experimenting with fishing under sail and oar to supply our family with fresh fish. Hi Nick, Great to hear from you! What you’re doing sounds really interesting – what kind of boat are you using? Would love to hear more about how you’re getting on. Currently we have a 1950’s Tideway – a small but sturdy (12ft)clinker sailing dinghy and sail it out of Saltfleet Haven, a small tidal creek. We can get out to the sea and back about an hour either side of high water.We live three miles south of the creek and trail the boat there with the car. Not ideal but this is our starting point. I would like to have a slightly larger vessel on a mooring at the creek so I can get to it by bike and bike trailer. The boat has been modified into a cruising dinghy so can be slept and cooked on if in calm waters or beached( its has a boom tent).This means we can work the tides and catch a few hours sleep if needed. If we catch alot of fish in one session we can beach and drop off a load to be collected and frozen. The idea is to target species which are doing well(strong stocks) and therefore easy to catch – whiting in the winter, mackerel in the summer, dogfish, dabs and flounder all year round if they are about.The fish will be for us, the cats and the dogs who live with us. If we don’t gut at sea, the guts will go into the humanure bin and end up fertilising the garden – nothing will be wasted. Its a slow process learning the tides, finding the marks and knowing what winds will work best in terms of swell, chop and getting to where we want to fish and being able to get back. Last year was our first year experimenting and we spent most of it learning to navigate the shallow channel, and getting in and out over the bar in different conditions. This year we plan some full tide trips and will hopefully catch some fish! Terrific idea, when we retired to Cornwall we gave up a half acre garden and I decided not to take up an allotment outside Falmouth on the grounds that it was hard work and having done that a food equivalent value could be got from fishing. I have a twelve-foot double ended sailing dinghy on the foreshore at Flushing set right for fishing in the new season if health permits. It is very similar to the old Peter Boats that fished the Thames Estuary. Thank you! Love the sound of what you’re doing too. We’ll look out for you if we’re sailing over your way. Just had a quick look at your site – your boat looks lovely, looking forward to reading more! An absolutely brilliant idea, locally caught fish is kinder to the environment and helps local people. I wish you all the best with your venture. Hi Cat and Simon, have been following your amazing story as we have been paddling around Britain. Just wanted to wish you all the best for the launch on Sunday and to say sorry we can’t be there to join you in the celebrations. Look forward to seeing you fishing in Gerrans Bay! Thank you so much Andy! Looking forward to catching up now that you’re back. What an incredible achievement to do what you’ve done – we are in awe! Congratulations – hope you enjoy celebrating this week, I know we are!! Sounds a fantastic idea, I know I’m a bit late finding you but better never late than never, I’ll be watching regularly in future and may even manage to put a wee bit in now and then 9what a shame I’m living in England (that county you don’t talk about!) at the moment – yer Oi’ve hear o’ tha place me ‘ansom! “Over the next few weeks and months we’re going to be designing and building our boat while trying to find out and learn as much as possible about fish and fishing” – how’s your boat now, probably it looks amazing, hope to see some more photos. Thank you! Plenty more photos to come…or have a look on our Facebook page for a preview!! This is a truly wonderful project! Many thanks for the five ultra fresh mackerel last Wednesday and the brilliant service getting them to our camper van. Best wishes for your business and may it sustain long into the distant future. What sort of fish do you sell ? A word of warning to all – learn your local weather and your capabilities! A small sail and oar boat is the quickest way to a watery grave if you get it wrong! The bigger the boat the safer it is of course but do not go outside the harbour if your boat is under 14 feet long and even then do not go out alone! Good luck to you all but please be careful out there – you only get one chance! If in doubt don’ty go out!